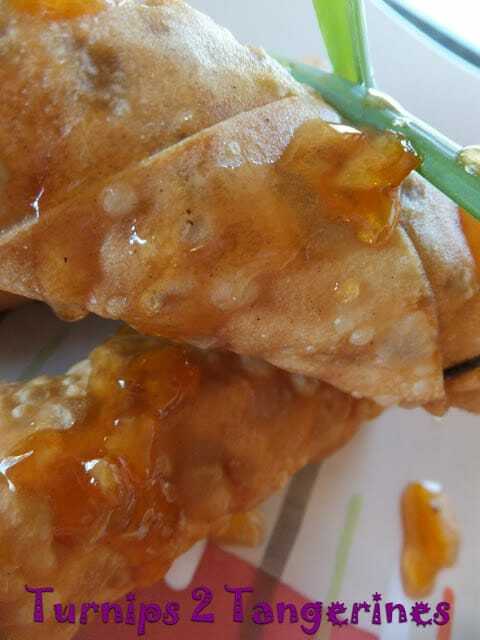 Pork Egg Rolls with Orange Sauce are fast, easy, portable and best of all delicious. Egg rolls are a great way to use up leftovers. Just about anything can be enclosed in a egg roll wrapper. Ground pork is used in this recipe but ground turkey will work also. When we make egg rolls here at Turnips 2 Tangerines, coleslaw blend is our cabbage of choice. So much easier than shredding a head of cabbage and your knuckles on a box grater. Traditional egg rolls are always deep fried but now that more and more people have become health conscious, egg rolls are now often baked and not fried. When baking egg rolls, line them up single file in a baking dish. Spray them well with a non-stick cooking spray. Bake until crispy and light golden brown. The inside should be hot as well. Just remember that baked egg rolls will have a slightly different appearance than deep fried but baked are delicious all the same. 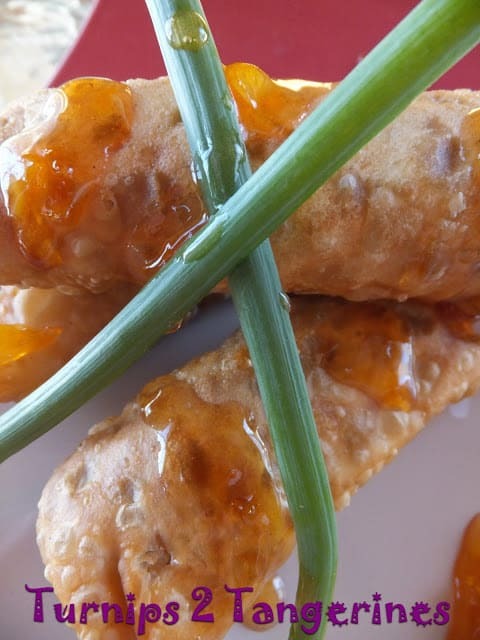 Pork Egg Rolls are dipped into a delicious slightly spicy, sweet orange sauce. Made with sweet orange marmalade, Malibu coconut rum, bottled sweet sour sauce and hot chili peppers. Make an alcohol free sauce and replace the Malibu rum with orange juice, coconut milk or water. 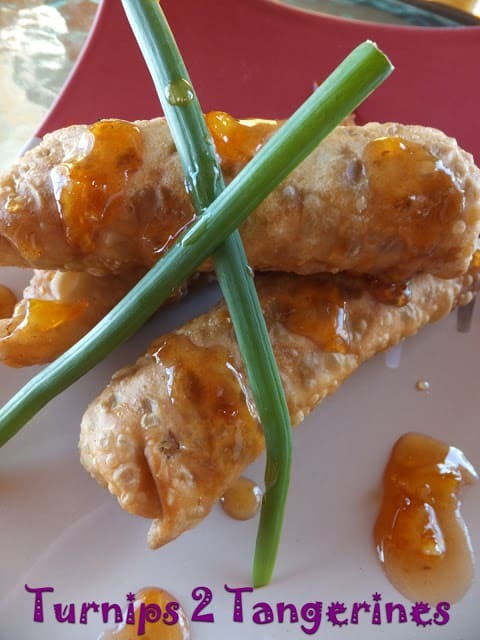 Delicious pork egg rolls with a fantastic dipping sauce. In a small bowl, combine cornstarch, soy sauce and sesame oil; set aside. Heat 1 tablespoon oil in large skillet or wok over medium-high heat until hot. Add coleslaw blend, bean sprouts, onions and ginger root; cook and stir 3 to 4 minutes or until veggies are tender. Add pork and cornstarch mixture; cook and stir until mixture is fully coated, 1 to 2 minutes. Remove from skillet; cool to room temperature. In deep fryer, heavy saucepan or wok, heat 3 to 4 inches of oil to 375º F.
Meanwhile, place 1 egg roll wrapper on working surface with 1 corner facing you. Place 1/4 cup coleslaw mixture slightly below center of egg roll wrapper. (Cover remaining skins with a damp paper towel to prevent from drying out) Fold corner of egg roll wrapper closest to filling over filling, tucking point under. Fold in and over flap. Wet the remaining corner with water; gently roll the egg roll toward remaining corner and press to seal. Repeat with remaining egg roll wrappers and coleslaw mixture. Fry egg rolls in hot oil, a few at a time, 4 to 6 minutes or until golden brown, turning once. Bring to a boil, reduce heat and simmer 10 minutes. 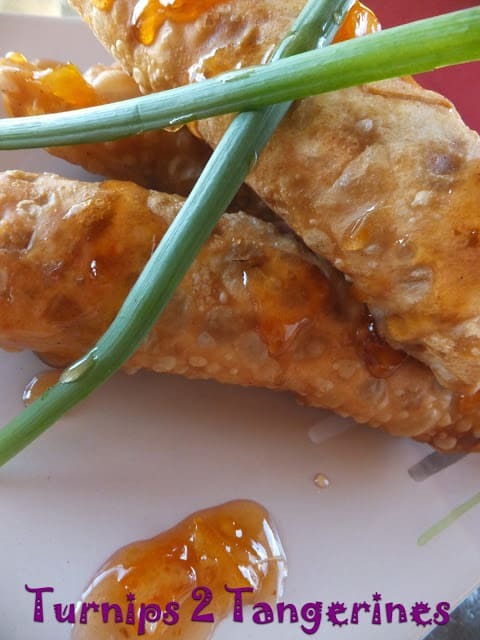 Here are a few more egg roll recipes you’ll want to try. Shrimp Egg Rolls, Pineapple Pork Spring Rolls and Stuffed Poblano Pepper Egg Rolls. This recipe is made with Kraft Sweet Marmalade and Malibu Coconut Rum. Egg rolls rock, and these look wonderful! Thanks so much for sharing at Wicked Good Wednesdays, I hope you'll come back tomorrow and link up again! Thank you so much for sharing your awesome recipe with Full Plate Thursday. Hope you have a lovely week and come back soon! My kids will get such a kick out of making these… thanks so much for sharing this recipe with us on foodie friday. I've always been intimidated by the egg roll. Maybe it's the pot of scalding hot oil. But this post is tempting me. They look delicious! How do you know that I totally love egg rolls?? Pinning! !